Someone last week asked me, what’s the difference between Best Practice, and Lessons Learned. Now I know that some KM pundits don’t like the term “Best Practice” as it can often be used defensively, but I think that there is nothing wrong with the term itself, and if used well, Best Practice can be a very useful concept within a company. So let’s dodge the issue of whether Best Practice is a useful concept, and instead discuss it’s relationship to lessons learned. My reply to the questioner was that Best Practice is the amalgamation of many lessons learned. 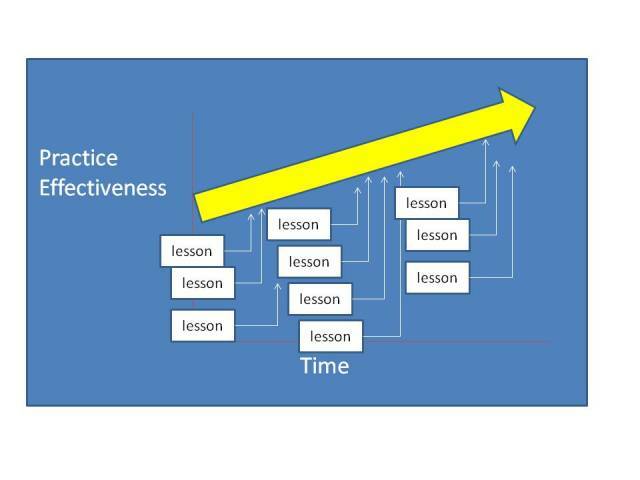 If we believe that learning must lead to action, that lessons are the identified improvements in practice, and that the actions associated with lessons are generally practice improvements, then it makes sense that as more and more lessons are accumulated, so practices become better and better. A practice that represents the accumulation of all lessons is the best practice available at the time. See the diagram (though really instead of a steadily increasing arrow, it should go up in small incremental steps, but that’s beyond my drawing ability). I’m pretty sure that Nick gets this but I just wanted to labour the point because people are dumb and as John Wayne once said “Crooked people are made the same way as crooked rivers – they both follow the path of least resistance” If you just apply lessons at face value, if you do not have an active programme to ensure that your best practice remains current, practical and relevant, then that big yellow arrow might actually start heading south. In every organisation and process there is also a point, and we are still working on how best to define and identify it, where more established best practice starts to fade away, that point where the reason why starts to grey out…and we forget why we do some procedures that might have been perceived as enduring and drift off that path of truth and light…may be life is really just an endless cycle of Groundhog Days? This entry was posted in Learning by SJPONeill. Bookmark the permalink.